Human identification during mass disasters using the stereotyped techniques such as fingerprint analysis is a cumbersome task. With a view to overcome this predicament, dental evidence of the deceased has gained importance in the recent years. Various branches of dentistry have augmented forensic research through innumerable scientific contributions. 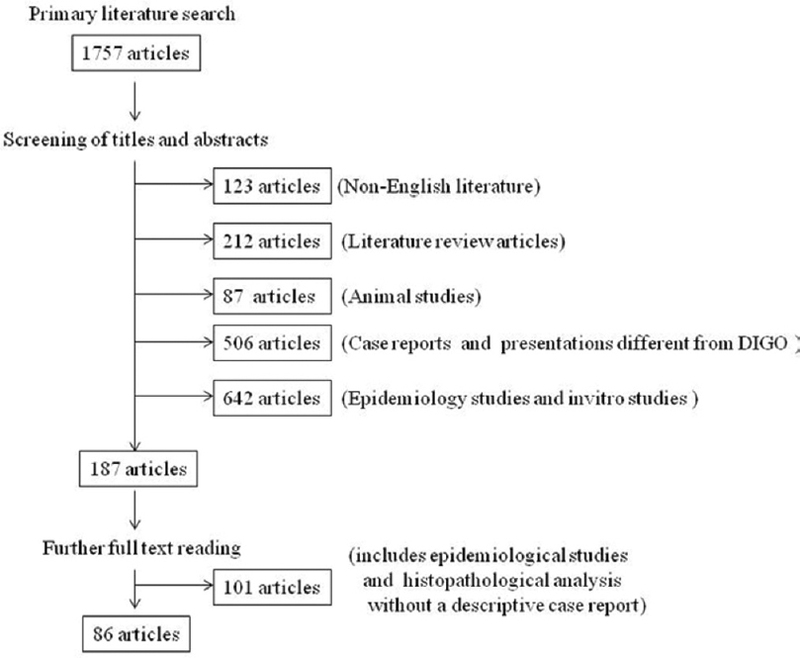 The following narrative review of literature aims to summarize the findings of studies that reported periodontal associations or potential associations that could play a role in forensic research. It is designed to inspire the “perio-society” to lend a helping hand to forensic odontology. Over the years, probiotics have been used in the treatment of a variety of diseases. The use of probiotics in the treatment of periodontal disease has caught on over the last decade or so. This review was performed to determine whether administration of probiotics produced a lasting clinical benefit in the treatment of periodontal disease. 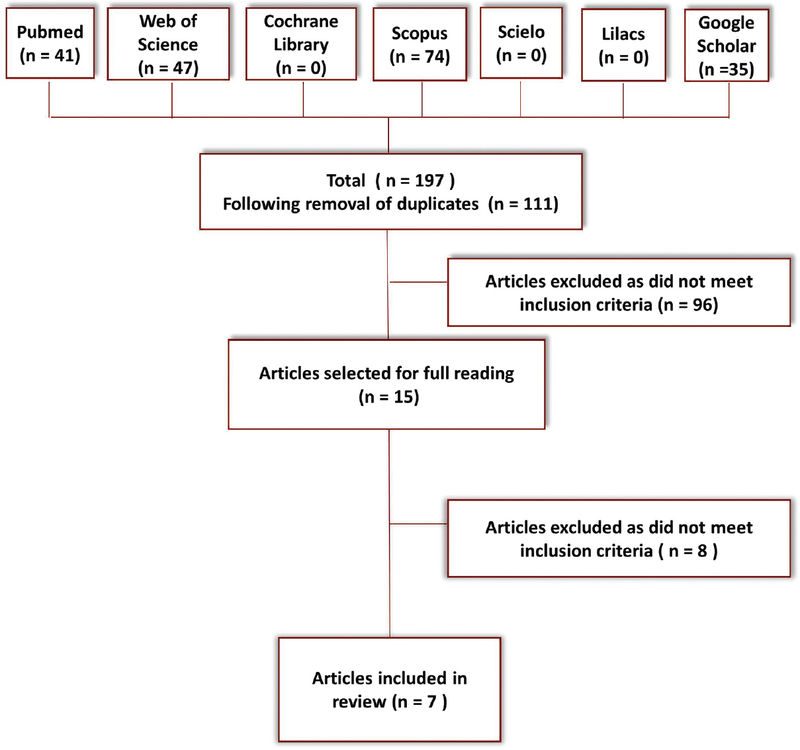 A MEDLINE, Cochrane database and a hand search was performed on human randomized placebo controlled trials using probiotics in the treatment of periodontal disease. A total of thirteen papers which addressed the question of the use of probiotics in the treatment of periodontal disease were retrieved. Most of the studies reviewed showed only a short term benefit with regards to reduction in gingival inflammation and probing depth reduction. Lasting clinical benefits were not seen in any of the studies. At least four different combinations and strains of probiotics have been used in the studies. There also existed significant heterogeneity in the methodology of the studies reviewed. It was concluded that current regimens of probiotics in the treatment of periodontal disease produce only short-term clinical and microbiologic benefits. Drug-induced gingival overgrowth (DIGO) is a well-recognized adverse effect of certain systemic medications. Calcium channel blockers, anticonvulsants, and immunosuppressants are frequently implicated drugs in the etiology of DIGO. Drug variables, plaque-induced inflammation, and genetic factors are the three important factors in the expression of gingival changes after systemic medication use. Careful clinical examination and thorough history taking form the basis for diagnosis of DIGO. Histopathological examination is often neglected; however, it is an important aid that helps in differential diagnosis. 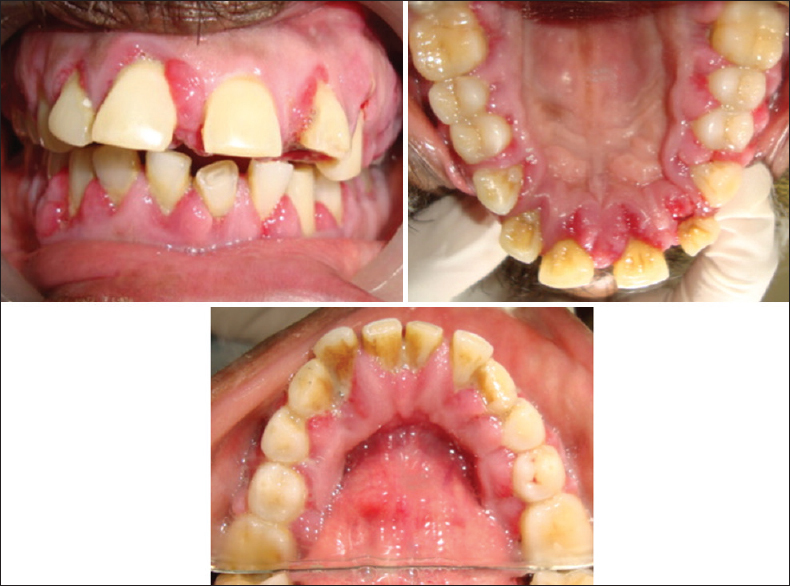 Cessation or change of drug and meticulous plaque control often leads to regression of the lesion, which however might need surgical correction for optimal maintenance of gingival health. The purpose of the present article is to review case reports and case series published in the last two decades and to assimilate and compile the information for clinical applications such as diagnosis and therapeutic management of DIGO. Background: Combating biofilm-dependent oral infections involves the use of synthetic antibiotics, which are often associated with bacterial resistance and adverse effects. As a result, herbs such as cranberry have emerged as an alternative treatment. The aim of this study was to evaluate, through an integrative literature review, the effectiveness of cranberry extract on cultures and biofilms of periodontopathogenic bacteria. Materials and Methods: In vitro and in vivo studies evaluating the action of cranberry extract on the growth, coaggregation and formation of periodontopathogenic bacteria and periodontal biofilm were identified. Searches were carried out in the “Cochrane Library,” “MEDLINE,” “Web of Science,” “Scopus,” “LILACS,” “Scielo,” and “Google Scholar” databases, using the terms: “vaccinium macrocarpon;” “cranberries;” “cranberry;” “biofilms;” “periodontitis;” “chronic periodontitis;” “aggressive periodontitis;” “periodontal diseases;” and “periodont*.” Results: a low number of studies evaluating the effectiveness of cranberry extract on periodontal disease were found, and no human studies were identified. In general, the eight studies included in the revision found that the compounds effectively inhibited the formation of a biofilm of Porphyromonas gingivalis and Fusobacterium nucleatum at concentrations equal or superior to 62.5 μg/ml, but did not significantly inhibit bacterial growth or promote the breakdown of preformed biofilm. Conclusions: while most of the studies presented certain methodological limitations, they did identify an inhibiting effect of cranberry on periodontal bacteria. These results serve as support for the development of further studies evaluating the most effective vehicle and ideal concentration that can be used without causing adverse effects on oral tissues. Background: Cytokines are significant in the development and progression of chronic periodontitis (ChP) and type 2 diabetes mellitus (DT2). Insufficient information is available regarding the pro- versus anti-inflammatory cytokines in ChP's influence on systemic levels of cytokines on DT2. This study investigated the levels of tumor necrosis factor-α (TNF-α), interleukin (IL)-4 and IL-6 in the serum of patients with ChP, DT2, and with both ChP and DT2, as compared to health. Materials and Methods: A total of eighty participants were grouped equally groups as healthy (NH), ChP with, and without DT2 (ChP and ChP + DT2) and only type 2 diabetes (DT2). Plaque and gingival indices, bleeding on probing, pocket probing depths, clinical attachment loss, were evaluated. Serum samples were collected to measure glycated hemoglobin, random blood sugar. TNF-α, IL-4 and -6 was assessed by ELISA. Results: The selected cytokines were detected in all the participants. TNF-α and IL-6 were highest in ChP + DT2 group, whereas IL-4 was highest in health. Significant differences and correlation were observed between the cytokines, periodontal, and glycemic parameters and among the four groups. Conclusion: TNF-α and IL-6 appear to heighten the inflammatory state in patients with both type 2 diabetes and periodontitis, but IL-4, though considered an anti-inflammatory mediator was not convincing in such a role in this study. The cytokine behavior needs to be studied further in larger studies. Objective: This study was conducted to assess the antiplaque efficacy of a mouthwash containing white tea. It also assessed the antibacterial properties of white tea against Prevotella intermedia (Pi), Porphyromonas gingivalis (Pg), and Aggregatibacter actinomycetemcomitans (Aa) in vitro. Materials and Methods: Forty-five subjects with healthy periodontium were randomly chosen and were divided into three groups and advised to use mouthwashes A, B, and C (Group A, white tea; Group B, distilled water [placebo]; Group C, chlorhexidine) for 4 days. They were advised to refrain from any kind of mechanical oral hygiene techniques. Plaque index (PI) was checked on day 1 and 5. In vitro testing for against Pi, Pg, and Aa against white tea extract was undertaken. Results: PI significantly increased from day 1 to day 5 (P < 0.01) in Groups A, B, and C. In inter-group comparison, there was a statistical significant difference between white tea mouthrinse group and placebo group, chlorhexidine group and placebo group and also chlorhexidine group and white tea mouthrinse group. However, chlohexidine showed superior antiplaque activity. In vitro test, white tea showed effective inhibition against all three bacterial strains Pi, Pg, and Aa at 1% concentration. Conclusion: White tea mouthrinse potently inhibits plaque formation although not as comparable to chlorhexidine mouthrinse. Hence, for those preferring herbal products, white tea mouthrinse is a good option. Background: There are several surgical techniques in literature that have been used to perform root coverage (RC). Currently, the use of a resorbable collagen membrane (RCM) as a guided tissue regenerative material is one of the highly sought treatment modalities. The present study aimed at evaluating the clinical outcome of RC in the treatment of Miller's Class I and II recession defects in maxillary anteriors and premolars by coronally advanced flap (CAF) with and without RCM. Materials and Methods: This split-mouth study (bilateral buccal recession defects) was randomized to include 15 test (CAF + membrane) and 15 control (CAF alone) sites. 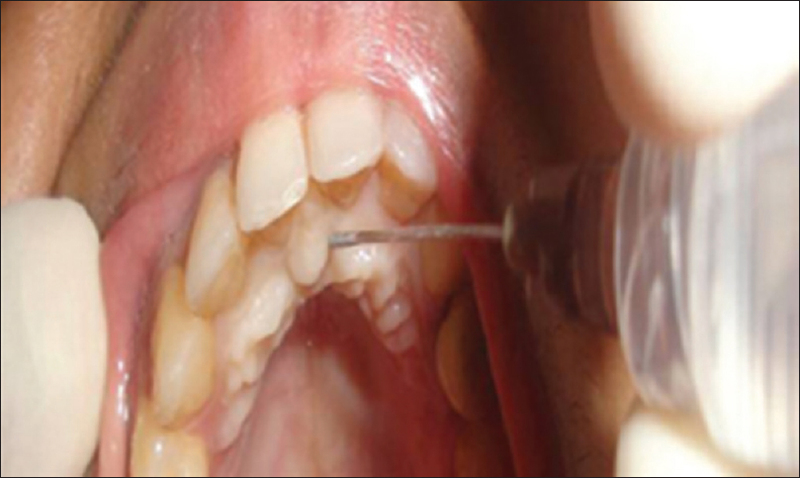 Clinical parameters included gingival recession depth (RD), probing pocket depth (PPD), clinical attachment level (CAL), and keratinized tissue height (KTH) measured at baseline and 9 months postoperatively. Results: Both test and control groups showed statistically significant (P < 0.05) reductions in RD (1.54 ± 0.46 mm and 1.60 ± 0.07 mm), PPD (0.53 ± 0.15 mm and 0.94 ± 0.10 mm), increase in KTH (0.67 ± 0.90 mm and 0.73 ± 0.14 mm) and CAL (1.94 ± 0.27 mm and 2.60 ± 0.19 mm) when comparing the 9-month data from baseline. The present study showed that mean improvement in RD was 1.60 ± 0.507 and 1.53 ± 0.64 mm in both test and control groups, respectively. Mean percent RC was 58.33% ±12.19% and 56.22% ±10.22% for test and control groups, respectively. However, there were no statistically significant differences between groups for RD, PPD, KTH, and CAL. Conclusion: The results of this study suggest that both the groups CAF (control) and CAF and RCM (test) could be successfully used to treat Miller's Class I and II gingival recession defects and also demonstrated an overall significant improvement in all the assessed clinical parameters. However, there was a greater reduction of gingival RD with the use of RCM when compared with the group of CAF alone. Aim: The aim of this study was to assess the awareness of periodontal disease, its influence on general health, and attitude toward periodontal disease management among medical faculty in Guntur district. Materials and Methods: In this cross-sectional study, 150 medical faculty members from different specialties in Guntur district were included in the study. A self-administered questionnaire was prepared based on knowledge, attitude, and practice surveys to assess the awareness of periodontal disease and its management. 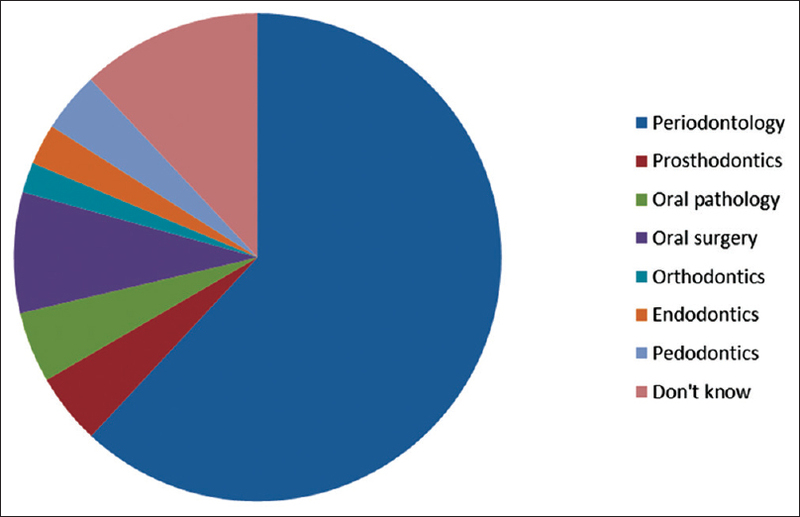 Results: Majority of the study participants (82%) had a previous dental visit. Only 31.3% believed that plaque is the major cause for periodontal disease. 56.7% responded that the relation between periodontal disease and systemic diseases is bidirectional. Only 39.3% were aware that periodontal disease is a risk factor for preterm low-birth weight infants. 52.6% of the medical faculty thought that scaling causes loss of enamel. 54.7% were aware that light amplification by stimulated emission of radiation is used in the periodontal treatment. Medical professionals who visited specialist in their previous dental visit obtained mean periodontal score (5.35 ± 1.686) greater than those who had visited general dentist and the difference is statistically significant (0.024). Conclusion: This study clearly demonstrates that medical practitioners had fair knowledge about various aspects of periodontal disease. This was particularly evident among those who have had a previous visit to a dentist. It was also found that young professionals with limited experience in the profession had better knowledge. Background: It is widely accepted that there are socioeconomic inequalities in oral health. A socioeconomic gradient is found in a range of clinical and self-reported oral health outcomes. Aim: The present study was conducted to assess the differences in oral hygiene practices among patients from different socioeconomic status (SES) visiting the Outpatient Department of the Sudha Rustagi College of Dental Sciences. Materials and Methods: A cross-sectional survey was conducted from June to October 2014 to assess the effect of SES on the oral hygiene habits. The questionnaire included the questions related to the demographic profile and assessment of the oral hygiene habits of the study population. Results: Toothbrush and toothpaste were being used significantly (P < 0.05) more by lower middle class (84.4%) and upper middle class (100.0%). A significantly higher frequency of cleaning teeth (twice a day) was reported among the lower middle class (17.2%) and upper middle class (21.5%). The majority (34.3%) of the study population changed their toothbrush once in 3 months. The cleaning of tongue was reported by patients belonging to the upper middle (62.0%), lower middle (52.1%), and upper lower class (30.0%). The use of tongue cleaner was reported to be significantly (P < 0.05) more among upper middle (10.1%) class patients. A significantly higher number of patients from the lower class (81.3%) never visited a dentist. Conclusion: The oral hygiene practices of the patients from upper and lower middle class was found to be satisfactory whereas it was poor among patients belonging to lower and upper lower class. Background: The oral cavity being a natural moist environment, topical application reduces its potency and effectiveness, but the nanoparticles in the Nano-Bio Fusion (NBF) gel are efficient in rapidly penetrating the cells. The purpose of the study aimed to evaluate clinically and microbiologically the effectiveness of locally delivered NBF technology gel as an adjunctive therapy to scaling and root planing (SRP) in the treatment of chronic periodontitis. 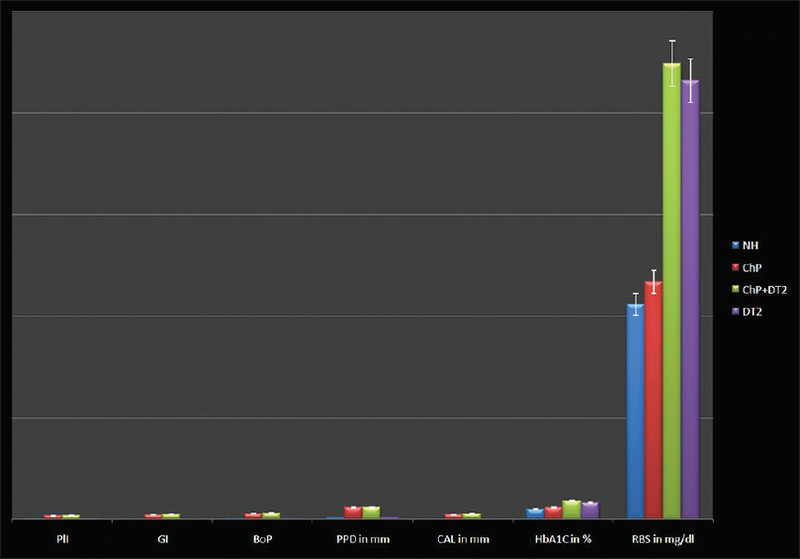 Materials and Methods: Six chronic periodontitis patients with 76 sites and probing pocket depth (PD) between 5 and 7 mm were selected in a randomized controlled clinical trial. SRP was performed in both control and test group followed by NBF gel application in 38 sites. The plaque index, gingival index, papillary bleeding index, probing PD, and clinical attachment level (CAL) were recorded at baseline, 6 weeks, and 3 months. 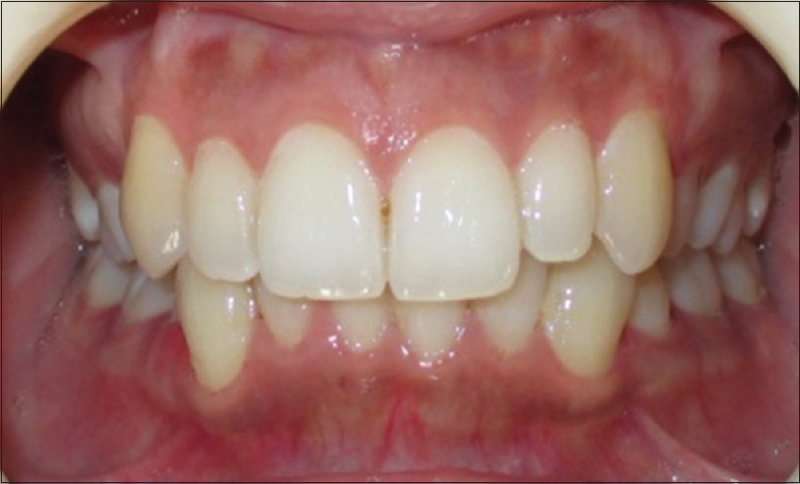 Supragingival microbial plaque analysis was done at baseline and 6 weeks interval. The statistical analysis with paired t-test was used to compare the test and control sites. Results: From baseline to a period of 3 months, a statistically significant difference was seen between both groups for PD, CAL, P value being PD (P = 0.001) and CAL (P = 0.01) along with the significant reduction of colony-forming units of aerobic periodontopathogens. Conclusions: Locally delivered NBF gel exhibited a significant improvement compared with SRP alone in chronic periodontitis. Background: Hyaluronan is a critical component of the extracellular matrix and contributes significantly to tissue hydrodynamics and cell migration and proliferation. Studies have demonstrated its anti-inflammatory, antibacterial, and regenerative effects. The present study aimed to assess the clinical effects of the subgingival application of 0.8% hyaluronic acid gel as an adjunct to scaling and root planing (SRP) in the treatment of generalized chronic periodontitis. 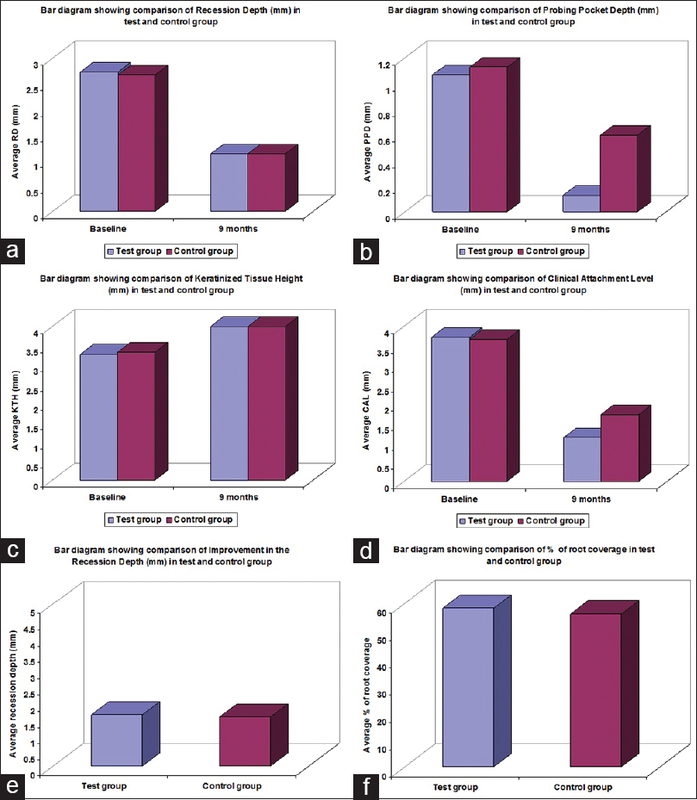 Materials and Methods: Patients with chronic periodontitis were recruited to participate in a study with a split-mouth design and provided informed consent. One hundred sites were included in the study and divided into fifty test sites and fifty control sites. These were assessed for plaque index (PI), gingival index (GI), pocket probing depths, and relative attachment level (RAL) at-pretreatment (baseline), 4, and 12 weeks posttreatment. The patients received full-mouth SRP. A 0.8% hyaluronan gel was administered subgingivally in the test sites at baseline and after 1 week. Significant differences between test and control were evaluated using the t-test, analysis of variance (test) followed by Bonferroni post hoc test. Results: A significant reduction in PI and GI was observed in both groups at 12 weeks (P < 0.05). Significant reduction in the pocket probing depths and gain RAL was observed in both the groups as compared to baseline (P < 0.05). The hyaluronan group compared to control at 12 weeks showed statistically significant reduction in the probing pocket depth and gain in RAL (P < 0.05). Conclusion: The subgingival application of 0.8% hyaluronan gel in conjunction with SRP may have a beneficial effect on periodontal health in patients with chronic periodontitis. Background: The palatal approach of anterior superior alveolar (P-ASA) using WAND injection was reported to effectively provide a profound bilateral maxillary anesthesia of the soft tissue of anterior one-third of the palate and facial gingivae extending from canine to canine which lasted for more than an hour thus making it ideal for scaling root planing and minor periodontal procedures in the anterior maxilla. Our study suggests that the conventional P-ASA injection is of very short duration and the extent of anesthesia was not profound and consistent. This has not been reported earlier in the literature. 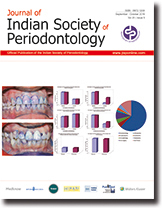 Materials and Methods: Thirty-five cases (20 males and 15 females), who underwent scaling, root planing and minor periodontal surgical procedures such as abscess drainage, gingivectomy, and frenectomy in the maxillary anterior region in the age range of 19–45 years was assessed for the efficacy of the P-ASA injection. After the administration of the P-ASA injection, the subjective and the objective symptoms were used to evaluate the extent and duration of the anesthesia at 10, 15, and 20 min. Results: This study suggests that the conventional P-ASA injection technique does not provide anesthesia for more than 20 min. Wilcoxon matched pairs test was used to compare the effect of anesthesia at the different time intervals and the results were found to be statistically significant (P < 0.05). 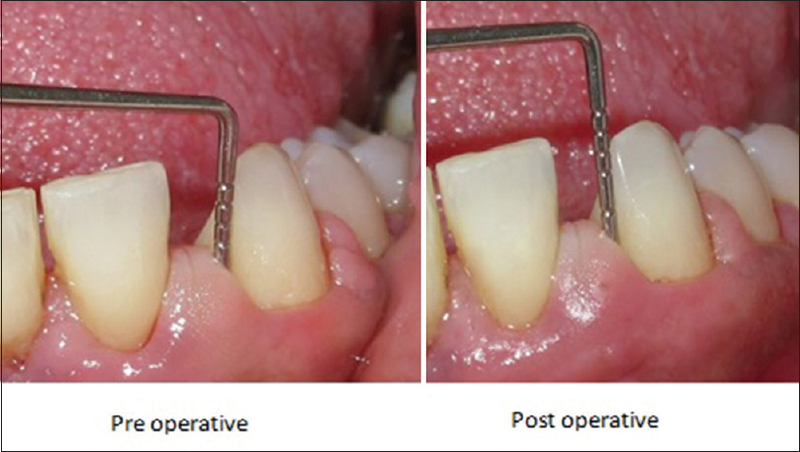 Conclusions: The conventional P-ASA injection technique is of very short duration and does not demonstrate effectiveness in periodontal surgery of the anterior maxilla. Antiphospholipid antibody (APLA) syndrome is a noninflammatory autoimmune disease, with innumerable clinical manifestations ranging from recurrent thrombosis and pregnancy morbidity to valvular lesions, transverse myelitis, thrombocytopenia, and hemolytic anemia. APLAs in antiphospholipid syndrome (APS) are well-known risk factors for cerebrovascular accidents. Stroke is the most common manifestation of APS in the central nervous system. Gingival enlargement is a known side effect of phenytoin which is an antiepileptic drug. This can have a significant effect on the quality of life as well as increasing the oral bacterial load by generating plaque retention sites. The management of gingival overgrowth seems to be directed at controlling gingival inflammation through a good oral hygiene regimen. Thus, this case report aims to describe the conservative management of phenytoin-induced gingival enlargement combined with inflammatory enlargement in a patient with APLA syndrome. The aim of this report is to diagnose the cause for episodic, shifting type of mild inflammation in the isolated areas of gingiva noted by the patient for 1 year. A 33-year-old female patient presented with a chief complaint of mild pain and occasional burning sensation confined to the gingiva to the Department of Periodontology and Oral Implantology. 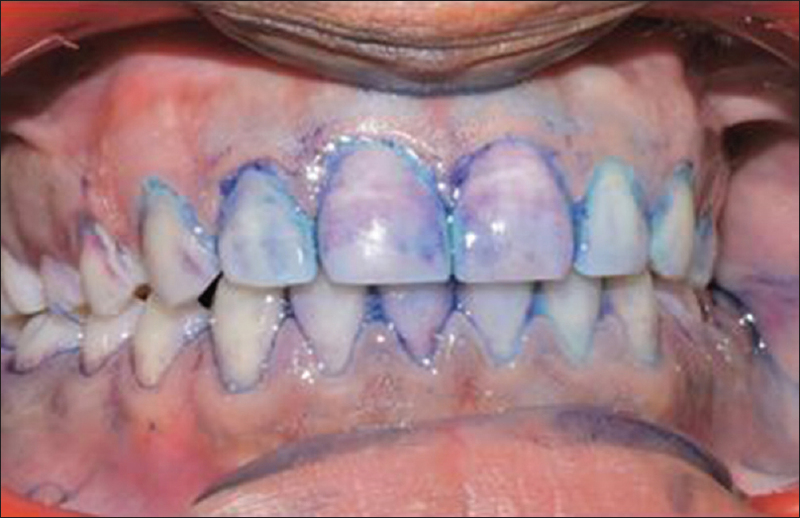 Clinical presentation of the gingiva was seen to mimic mild form of gingivitis for 1 year, with no noted systemic involvement gingival biopsy was performed. The presence of Tzanck cell was noted along with intraepithelial split pointing toward pemphigus. Thus, the study concludes that thorough and meticulous gingival examination can reveal the picture of underlying systemic alterations and is the key for early diagnosis and prompt treatment.